Shoe Cartel, an online store with a focus on providing a great shopping experience for shoes online, has expanded its stock for the holiday season. It has also launched a special offer with items up to 80% off. 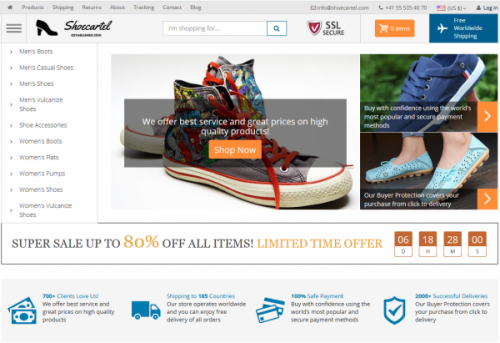 Shoe Cartel, an online store with a focus on providing customers the best shoes at affordable prices online, has expanded its range of products for the holiday season. Customers can find a wide range of options, from sneakers to ballet pumps, ankle boots and more. Shoe Cartel is a company that features a team of enthusiastic developers and entrepreneurs who decided to convert their common experience into a web store. The goal of the company was to create a shop where customers could easily find what they were looking for and buy their ideal footwear. Established in 2010, Shoe Cartel has developed a reputation for premium footwear at affordable prices. Visitors to the store can easily find what they’re looking for, and rely on the site for providing fast delivery and free worldwide shipping. The team behind Shoe Cartel is passionate about providing customers with the best, easiest and most streamlined shopping experience online. It’s important to ensure that each customer can find what they’re looking for in a pleasant, hassle free way. Customers can browse through a range of different categories on the Shoe Cartel online store to help them find their ideal footwear. These include men’s boots, men’s casual shoes, men’s shoes, men’s vulcanize shoes, shoe accessories, women’s boots, women’s flats, women’s pumps, women’s shoes and women’s vulcanize shoes. As part of the holiday season product expansion, a limited time sale has also been introduced, and customers can get items up to 80% off. Among the most popular types of shoe on the online store are women’s faux suede thigh high stretch boots, women’s snow warm winter lace up boots, and real leather moccasins. Customers can shop safe in the knowledge that they get a 100% money back guarantee within 14 days of their purchase. Those wishing to find out more about Shoe Cartel can visit their website on the link provided above.